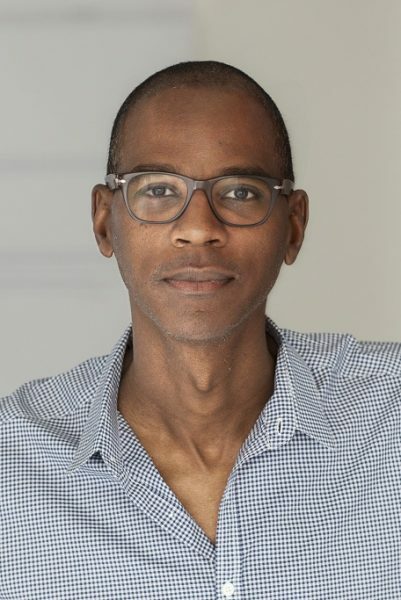 Mark Bradford was awarded the Medal of Art for his longtime contributions to Art in Embassies and cultural diplomacy on January 21, 2015. Mark Bradford was born in 1961 in Los Angeles, California, where he lives and works. In 1997 Bradford graduated with a Bachelor’s of Fine Arts and Master’s of Fine Arts from the California Institute of the Arts in Valencia, California. Bradford is a recipient of the 2014 National Medal of the Arts. Other major awards include The McArthur Fellowship (2009) and the Bucksbaum Award, granted by The Whitney Museum of American Art (2006). Bradford has shown extensively in international and national exhibitions. Recent solo shows include the major touring exhibition Mark Bradford’ presented at the Wexner Center for the Arts, Colombus OH (2010), followed by three other locations in the United States; ‘Merchant Posters’, Aspen Art Museum, Aspen CO (2010); and ‘Neither New nor Correct: New Work by Mark Bradford’, Whitney Museum of American Art, New York NY (2007). ‘Mark Bradford: Sea Monsters’, currently on display at the Rose Art Museum in Waltham MA; will tour to The Gemeentemuseum Den Haag, Netherlands in 2015. Later in 2014 will see the unveiling of a special commission installation ‘Bell Tower’ at LAX Airport, Los Angeles CA. A new body of work will be presented at The Rockbund Art Museum in Shanghai, China in 2015. Selected public collections include The Metropolitan Museum of Art, New York; The Museum of Contemporary Art, Chicago; The Museum of Fine Arts, Boston; The Museum of Modern Art, New York; The San Francisco Museum of Modern Art; The Solomon R. Guggenheim Museum, New York; The Walker Art Center, Minneapolis; and The Whitney Museum of American Art, New York.